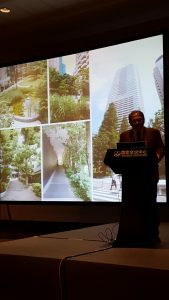 Restoring biodiversity by reforesting urban fabrics is one of common urgent tasks for cities in the world in general and in the Asia and Oceania region in particular. After all, seven of the ten largest cities in the world are in this region. One of these cities is Tokyo. It accommodates 10 million people. More than 30 million people live in the national capital region; this is one third of the total population of Japan. However, despite the high number of population in Tokyo, one third of its area is mountainous, largely covered by natural and planted forest patches.